Here is the first episode of my new series JULOT & CIA. I am currently shooting and editing a serie of short formats, to be discovered soon too. After several months of locations on a feature film, I resume the writing of several personal projects. OPEN WINDOWS is in the selection of the ZeFestival festival. It will be screened on saturday 7th october at 6:00 pm at the librairie Vigna of Nice. OPEN WINDOWS gets its Swedish premiere organised by the Spanish Embassy in Stockholm on August 3rd in the ELEUTHERIA film festival in KLARABIOGRAFEN. The CITY HALL of MADRID organizes, in the cultural program of the WORLD PRIDE 2017, a cycle of movies-debate to make visible a whole sector of the population inequitably forgotten: the elderly LGBTQ. OPEN WINDOWS been a part of this cycle and will be screened on Sunday, April 30th at 6:00 pm in the MATADERO CINETECA. I’ll be there for the debate. On April 26th, day of the Lesbian Visibility, at 7:00 pm, the COUNCIL FOR EQUALITY OF GRAN CANARIA and the collective LGBT GAMA, organize a projection of OPEN WINDOWS in the cinema Multimovies MONOPOL. The projection will be followed by a debate moderated by Silvia Jaén. OPEN WINDOWS is in the selection of the 12th ZINENTIENDO festival in Zaragoza. It will be screened on wednesday 26th april at 7:00 pm in the CENTER JOAQUIN RONCAL. Projection is organised in association with the INSTITUT FRANÇAIS. It’ll be followed by a debate with Boti García Rodrigo, Concepción Barberá and myself about “Giving spaces to the powerful age”. The writing of I’M IN THE DREAM’S WORLD continues in parallel of a new project of fiction, in co-writing. OPEN WINDOWS is now available on FilmDoo ! FilmDoo Brings Socially Aware Documentaries to an International Audience with Bespoke Platform⁩. I’ve answered an interview you can read on their blog. Italian’s première for OPEN WINDOWS who is in the competition of the FLORENCE QUƎER FESTIVAL in Florence, Italy. It will be screened tomorrow, Saturday, November 12th at 4:00pm in the CINEMA TEATRO LA COMPAGNIA. Micheline Boussaingault y Jocelyne Pasqualine, two of the characters of the movie will be there. Remember : OPEN WINDOWS will be screened on this Saturday, November 5th at 1:00 pm in the KELLERKINO in the selection of the QUEERSICHT N°20 of Bern in Switzerland. I’ll be there for a session of questions/answers! I have the honor to be a member of the documentary jury of the festival LESGAICINEMAD of Madrid ! Italian’s première for OPEN WINDOWS who is in the selection of FLORENCE QUƎER FESTIVAL in Florence, Italy. It will be screened on Saturday, November 12th at 4:00pm in the CINEMA TEATRO LA COMPAGNIA. The autumn is full of good news! OPEN WINDOWS is in the selection of the QUEERSICHT N°20 of Bern in Switzerland. It will be screened on Saturday, November 5th at 1:00 pm in the KELLERKINO. I’m invited by the festival for a session of questions / answers! I’m very happy to announce that OPEN WINDOWS is in the selection of the 23th WOMEN MAKE WAVES Film Festival in Taiwan and will be screened on the following dates at SPOT-Huashan, Taipei City: 10/18 10:30 & 10/22 15:50. Summer is the perfect moment to read quietly or see movies like OPEN WINDOWS. I’ve just uploaded the short movie I’ve directed in 1996 (how far it seems…) NEIGHBORHOOD (only in french’s version). The dates of Springfield’s festival have changed. It will be from Sunday, the 21st to Thursday, the 25th of August. I’m very happy to announce that OPEN WINDOWS is selected in competition in his first film festival of the United States. OPEN WINDOWS is now on VODD, in french version! Thursday 31th March at 7:30PM, organized by Extremadura Entiende it will be a projection of OPEN WINDOWS in the Centro cultural Alcazaba of Merida in Extradura. The projection is included in IMEX‘s program for the International Women’s Day. It’ll be followed by a debate with one of the protagonists: Boti García Rodrigo and myself. The debate will concern the taboos, the problem and the experiences of homosexual women upon the arrival of the adulthood. OPEN WINDOWS is now available on FILMIN, in spanish version! At 8:00 pm, unique projection of OPEN WINDOWS in the LUMINOR followed by a debate led by Anne Faisandier and Isabelle Bony documentary directors and members of ADDOC in the presence of three of the protagonists of the movie and myself. Open Windows is a movie presenting a priori a subject of niche. How can this subject can be, during the movie, transcent to become universal? How does the intimate portraits of four homosexual septuagenarians drags far beyond the kind, beyond the age, the sexual orientation, the culture and beyond stereotypes? It’s what will approach our debate on this movie of a resolutely optimistic point of view, which enlightens its subject in small touches and opens a window, allowing each to wonder and to envisage the ageing, as much his as that of the others. OPEN WINDOWS is in the selection of ROZE FILMDAGEN festival ! It will be screened in Amsterdam on Friday, 11 and Saturday, March 19th. While waiting for the end of the editing of the documentary BAXTALO DROM, EL CAMINO DE LA SUERTE, here is a clip of one of the jam sessions of the group BAXTALO DROM. It’s Christmas before Christmas! Here is the logo created by Emmanuelle Janvier for delicias films in Coopetic Productions. OPEN WINDOWS continues to perform and is in the selection of the 31th festival LGBT of Ljubljana, in Slovenia. It’ll be screened on Friday, December 25th at 8:00pm. OPEN WINDOWS received the audience award for best documentary in MOVILH, in Chile ! OPEN WINDOWS will be screened on Saturday, November 14th at 6pm in the room Borau in Matadero in Madrid in LESGAICINEMAD. 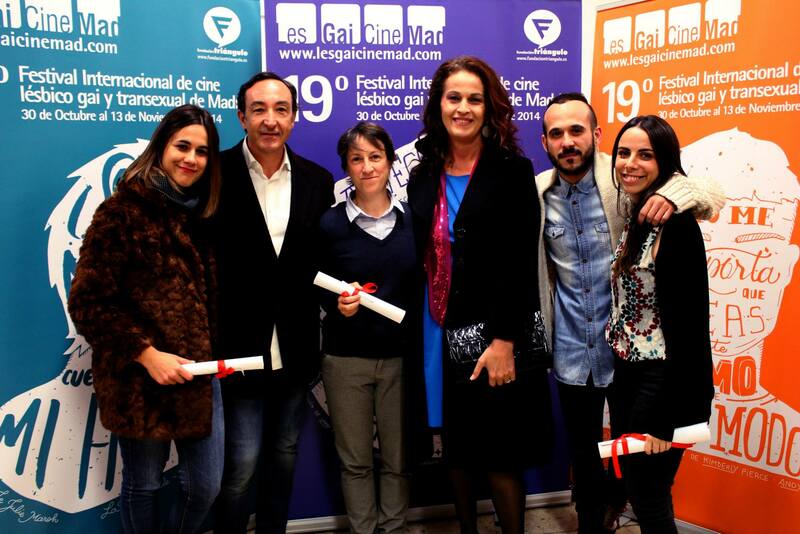 Last year, the movie received the award for best Spanish documentary in LESGAICINEMAD. LE FESTIVAL DES LIBERTÉS in Brussels created an on-line video library which allows schedulers and buyers to view movies which were not selected in their competition ( 32 selected movies). OPEN WINDOWS is in these virtual catalog (46 selected movies). Don’t miss it! On sunday October 18th at 5:00pm OPEN WINDOWS will be screened in the MOVILH film festival in Santiago in Chile! Today, October 1st, on UN International Day of Older Persons 2015, some clips of OPEN WINDOWS are in the SILVER RAINBOW campaign by ILGA-EUROPE! Leaves fall, good news also! OPEN WINDOWS is now distributed by JAVA FILMS. What a beautiful autumn ! Next month, in october, OPEN WINDOWS is in the selection of MOVILH in Chile. The comeback from holidays begins really well for OPEN WINDOWS ! It will be screened between day 8th and 14th of this month in the IX edition of LLamale H Festival in Montevideo, in Uruguay. Then, between 10th and 17th, it will be in the Section International Competition of the 7th edition of the festival Liber Cine in Buenos Aires, in Argentina. It will also be in SQIFF and will be screened on Friday 25th in Glasgow, in United Kingdom. OPEN WINDOWS continues its round with 8th FESTIVAL DE CINE DE LA DIVERSIDAD AFECTIVO SEXUAL de Santa Cruz de la Sierra, in Bolivia, will take place between 26th and 30th of this month. The slogan’s festival is: Love blooms in autumn. Excellent news of the summer end:I’ve just won the best director award in the TORONTO INTERNATIONAL QUEER WEST FILM FESTIVAL in Canada with OPEN WINDOWS and the movie will be in selection in several festivals at the end of the month and throughout the autumn. Another wonderful news : OPEN WINDOWS was selected to the LEEDS QUEER FILM FESTIVAL who will take place in July in United Kingdom. The movie will be screened on Sunday 19th July. Another good news : OPEN WINDOWS is in the selection of the festival LA OTRA BANQUETA who will take place in July in Guatemala. A whole world tour! OPEN WINDOWS is in the selection of the Vth MUESTRA DE CINE LESBICO DE MADRID. It’ll be screened on Tuesday 30th June at 8:30PM in Fulanita de Tal, Calle de Regueros, 9, 28004 Madrid. And it goes on for OPEN WINDOWS which is selected in competition at the MOSTRA LA PLOMA festival of Valence which will take place on June 5th, 11th, 12th and 13th. The movie will be screened on Friday 5th of June at 7:00pm in the Colegio Mayor Rector Peset. After the screening it’ll be a debate with Boti Garcia Rodrigo, one of the protagonists of the movie, tireless and real activist reference. Do not miss it ! OPEN WINDOWS will be screened on Thursday 28th of May at 11:15am in the Alliance Française de Bombay, Theosophy Hall, 40 New Marine Lines, Marine Lines, Mumbai 400 020, at the 6th KASHISH Mumbai International Queer Film Festival en India. I’m very happy to announce that OPEN WINDOWS is selected in competition at the film festivals OUTFESTPERU in Peru et TORONTO INTERNATIONAL QUEER WEST FILM FESTIVAL in Canada. The magnificent new poster of OPEN WINDOWS made by a very talented graphic designer : EMMANUELLE JANVIER. OPEN WINDOWS still on his way. It’ll be in competition in the 6th KASHISH Mumbai International Queer Film Festival, in India, in May. OPEN WINDOWS will be screened this wednesday 15h of April at 5:30pm, in the CINHOMO festival at the movie theater Casablanca of Valladolid, with the beautiful short domentary MAMIS by Virginia Fuentes, a movie that I really like very much. VUES D’EN FACE film’s festival offers on this Saturday 11th at 4:00pm in LE CLUB a tripple session : identity/feminism/lesbianism along generations, in which OPEN WINDOWS. will be screened. I shall be present. OPEN WINDOWS has been selected in the Xth Muestra de Cine LGBT of Murcia, who will take place from 18th to 23th may 2015. The movie will be screened on Wednesday 20th may at 08:00pm and on Saturday 23h may at 07:00 pm. It’ll be a debate after the screening. OPEN WINDOWS has been selected in the 15th édition of CINHOMO, LGBT film festival of Valladolid, who will take place from 13th to 19th april 2015. The movie will be screened on wednesday 15th april at 5:30pm at the Casablanca movie’s theater of Valladolid. OPEN WINDOWS arose from a discussion with my friend Michel Klein about her mother and my father. It was just after summer, 2011, when we had both spent a few days at our respective parents. We had wondered what conditioned the way of aging of each. I had decided to look for an answer to this question and had begun to work on the theme of the ageing in the community LGBT to make a documentary movie. Michel died on Friday, March 13th, 2015. I dedicate him the movie. Another great news ! OPEN WINDOWS will be at the International Gay and Lesbian Film Festival of Grenoble VUES D’EN FACE in April during a key session followed by a debate in the presence of the directors (“Las Ventanas Abiertas” and “Sextoy Story”) which will explore feminism and lesbianism in the course of generations. OPEN WINDOWS will be screened in the VI days about sexual-affective diversity and gender:”Women who love women” at the Rioja’s University. This Saturday, February 7th at 3:30pm, I will present OPEN WINDOWS in the DES IMAGES AUX MOTS film festival, in the movie theater ABC from Toulouse. I’ll present tonight Saturday, January 31st at 7:00 pm, in the Canary Islands Festival CAN[BE]GAY OPEN WINDOWS. It’ll be in the magnificent Tenerife Espacio de las Artes (TEA) of Santa Cruz de Tenerife. Don’t miss it ! OPEN WINDOWS will be screened on today Thursday, January 29th at 7:00 pm in MAC of Santa Cruz de Tenerife in the Canary Islands Festival CAN[BE]GAY. Tonight, Wednesday, January 28th at 6:00 pm OPEN WINDOWS will be screened in the ZINEGOAK Festival at BILBOROCK. The two french main characters and I will be there. OPEN WINDOWS has now a beautiful poster ! Further good news : OPEN WINDOWS will be in the ZINEGOAK Festival in Bilbao. The movie will be screened on Wednesday, January 28th at 6:00 pm at BILBOROCK. I’m very happy to announce that OPEN WINDOWS is selected at DES IMAGES AUX MOTS film festival from Toulouse. The movie will be screened on Saturday, February 7th at 3:30 pm in the ABC cinema of Toulouse. The year begins well for OPEN WINDOWS who will be at the end of January in the Canary Islands Festival Can[be]Gay. The movie will be screened on Thursday, January 29th at 7:00 pm in MAC of Santa Cruz de Tenerife and on Saturday, January 31st at 7:00 pm in the Tenerife Espacio de las Artes (TEA) of Santa Cruz de Tenerife. Good news again : OPEN WINDOWS is selected at the film festival ANDALESGAI in Seville. OPEN WINDOWS receives the Award for Best Spanish Documentary at LESGAICINEMAD Festival in Madrid. I’m very happy to announce that OPEN WINDOWS is selected in competition at the film festivals LESGAICINEMAD and EL LUGAR SIN LIMITES. It’s also selected in FANCINEGAY in Estremadura. Boti García Rodrigo, president of the FELGTB in « Las ventanas abiertas ».